Good morning most of you. We had our awards banquet Friday night. I thought you might like to see my date. Which one is the daughter? Beautiful Mother/Daughter duo up there Miss Kim…she has your smile and twinkle in her eye! NancyJ. Your mother is almost exactly six months older than I am. On Saturday, we’re going to load our bicycles onto the car and head south for the week. We’ll stop wherever it’s at least 70 degrees and there’s a decent bike trail. Looking forward to it! Last night someone in London sent me a real estate brochure for #45 Clapham Common North–the site of the Bible Training College. The photos are in color, of what the place looks like 104 years after the Chambers vacated. I invited folks to look at the pictures and tell me if the main ballroom–which was the lecture hall–looks the way I described it in my two books! Maybe that won’t work. I’ll try something else later. Off to Zumba and then work. That is a lovely photo, Kim. I made the right decision not to go to clinical today, as I am starting to cough a bit more now, as my lungs clear the inflammation. The hawk isn’t the best-ever photo of a hawk diving for prey because it isn’t totally in focus, but getting that particular speed in focus between branches with a camera that’s nowhere near the $14,000 bird lens is a lot to ask! You can see every part of the bird (including its eye) and all its colors (including the red smudge that gets it the “red-shouldered” name on its leading wing), and it’s clearly an action shot . . . This was from the day I had four sightings (not clear how many separate birds) of the red-shouldered hawk. I saw it on a tree over the pond, and then it flew. I walked down the sidewalk toward the trail, and I saw this hawk in a tree I was going to walk past–it wasn’t really close to the sidewalk, but close enough that my presence might bother it. But animals that perch along traveled routes get used to people, and that is the way I was walking, so I continued on. I took a couple of photos from a distance, and then as I drew closer I took one of it in the tree. 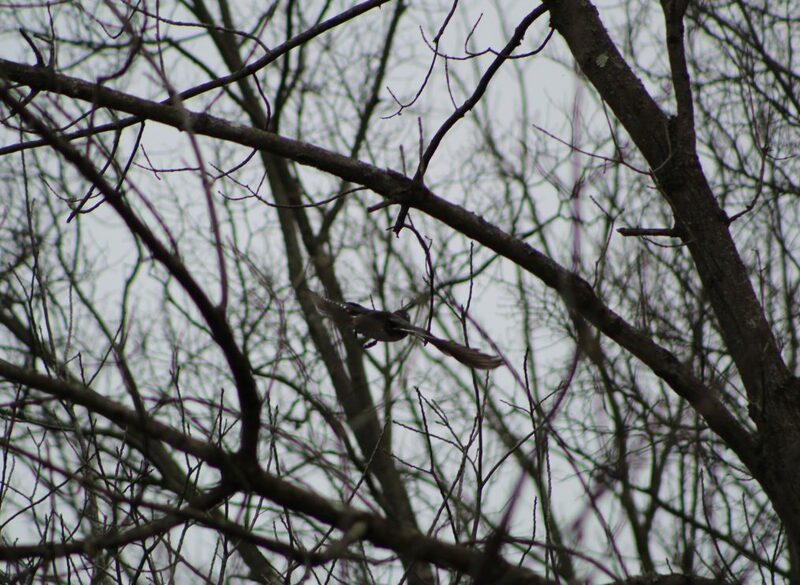 And as I clicked the shutter for a second photo, it exploded from the branch, heading down as if it saw prey. (This shot.) I couldn’t see the ground from where I was, and by the time I turned the corner to see the ground from a different angle, the hawk didn’t seem to be there, and I didn’t see it fly away. So I don’t know whether it caught its prey or where it went from here. Ten minutes later, as I was walking along the trail, a hawk flew in and landed in a tree, but whether it was the same one or not, I don’t know. On my return along the trail, I saw a fourth sighting, and that bird flew from its original tree, and then from the tree where it landed, while I watched. So I definitely saw it (or them) in action that day, including photographing it in flight here and from the back later. Michelle, I left you a comment on yesterday’s prayer thread that I’m not sure if you saw. Chas, on every week having to have “a Monday,” sadly true. While I could still just sleep, I am going to head in to work to see if I can’t get my internal clock running again. After 2 days of so much sleep and very little activity (though I still have no definitive ‘symptoms’ of being sick with anything), it’s time to get back to it. There’s a night neighborhood council meeting I *should* probably go to and cover (groan) but I think I’ll just follow up with phone calls to the key players tomorrow. Meanwhile, I may have problems on the south side of my house where I noticed a number of large paint bubbles/blisters yesterday, spread over a fairly widespread area. Real Estate Guy says this is bad. Sigh. Honestly, I don’t know what I’ll do if I have yet another major house failure going on. … Maybe just go back to bed again and pull the covers over my head. Real Estate Guy said to take pics of the wall today and then again after the next rains, see if there are changes, maybe check in with the Sherwin Williams folks to get their take on what they think is going on. My big worry is there’s water getting trapped inside somewhere in or on that exterior wall. That south side of the house takes a beating, it’s where the worst window/wood damage was and the stucco wasn’t in great shape in some places, as I recall the painters telling me. ‘The six-month investigation by the San Antonio Express-News and the Houston Chronicle found that since 1998, nearly 400 church leaders were accused of victimizing more than 700 people, including small children. You highlighted the issue for me. I’ve had little interest in the east and the thought of trying to understand Japanese and Korean culture over a 100 year period is daunting. Good afternoon! My Grabber arrived and the longish box was standing upright. I was afraid it would be flat on the ground so I would need a Grabber to get to my Grabber. I need to open if and put it to use. There’s been a newspaper/ad sheets sleeve on the driveway for two days now. Y’all are perfect Southern Belles, Kim, only lacking hoop skirts. Very beautiful! I am making soup today. It is good to have time to cook more healthy meals this tax season. I had to grocery shop real early yesterday before Art went to church. You both look beautiful, Kim. Good to see you two together. Janice, yes, good you didn’t need a grabber to pick up your grabber. They’re actually very lightweight, easy to handle & operate with one hand and surprisingly effective at pickup up all kinds of things. Mainly I need it for socks and other items that fall down into that narrow space between the dryer and wall. I brought a can of chili for lunch, decided to clear out some of those pantry cupboards. My Adorables adore the grabber. We have a plastic one someone gave us which I’ve never used for the intended purpose. We just watch the Adorables fight over it . . . The grabber has already helped me twice today. And it seems like it might make a good gift for my brother,too. I am always looking for something to give him. But he may have one that my mother got after her fall and hip surgrry. I am wondering if I could be skilled and coordinated enough to use a grabber for litter box duty. You should have seen the joy romp through the house Miss Bosley did after Art cleaned her bathroom. She was thrilled. Now she is master over another human at least for twenty minutes. Wondering if Jo cooked the brocolli? In other news, the Times posted a video of City Council staffers trying to catch a rat with a cardboard box (they failed, but it was fun to watch). I think I’ll drop the Jeep off in the morning to get the needed $120 (grumble) diagnostic test to see what’s up with the emissions system and ‘check engine’ light that won’t go off; if it’s something that can be fixed without a lot of drama and $$$, I may just get the smog test done there as well so I can cross the car registration off my ‘things to do’ list for Feb/March/April. It’s always a long and costly list for me this time of year. Oh, I once also used the grab-it to get a wall clock that was super high in the home office room/den down a couple years ago; I’d climbed up onto the desk to put it there but didn’t feel like doing that again. The grabber handled it nicely. Oh, and I was able to shut one of my little high hopper windows in the bedroom closet with it also. They are actually pretty handy if you’re one of the short people. Did I indicate Art went to church yesterday? I meant on Sunday. That was my only chance to shop this past week. At least there are no crowds on Sunday morning. Ah! It was Sunday! I did get the garbage can out to the street this a.m. Wow! See what happens when I stay home every day. I talked with Karen, but she can’t keep me on track since she is home every day, too. I meant to get a grabber at Christmas, but the only one that I saw was too long for my suitcase. ahh, the broccoli… well, I think that it cooked just fine, but…. I wasn’t ready to eat it so just let it sit, not realizing that it would continue cooking. so it is rather overdone. Perhaps I will try again next week. We got a free grabber from a large hardware/lumber store. It has been very handy to grab toys from under the couch after the grandchildren leave and getting things down. Ours is not so fancy. I used it to clean litter along our road one spring and it was damaged by what turned out to be a much heavier item than I expected. I should invest in a new one. I did use this one yesterday to help me get a plastic box down from a high closet shelf, but it does not work well. Oh, Jo, I am sorry. I posted after the first post that other recipes did not cook it for very long, about half what I said. I also texted you and sent an email in hopes I would catch you before you cooked it. Maybe when you are in the States again I can take you out for dinner. Again I am sorry. Roscuro, here is the other article from Baptist Press today. I use our grabber when I’m mowing the lawn. I ride around with it and a bucket and pick up random pieces of firewood the dogs have dragged out and any garbage or sticks and they go in the bucket. Dog toys get tossed to the side that’s already mowed. 🙂 Very handy. That would be handy. I have had children in the area to run up and pick things up. But usually I have to stop and get off but the exercise will do me good, I suppose. I have never heard of a “grabber” before. I can imagine what one is, but not how it works. But I imagine I could invent one if necessary. Westminster Dog Show is on tonight and Tuesday night. Lately, our grabber has mostly been used to retrieve Janie’s chew toy from behind the couch. She’ll look out the window in back of the couch with the toy in her mouth, then drop it. Then she looks down there as if she is surprised. “How’d that get down there?” Dumb dog.